Do a Google search for “clear hurricane shutters” and see what pops up. Every time I see this advertising claim it makes me scratch my head. After spending 3 years in the glass business and 20+ years in the plastic sheet, rod & tube business, some Einstein had the great idea to call these hurricane panels “clear”, which they most definitely are not. The correct description of these clear corrugated hurricane panels is “colorless obscure”. Colorless obscure glass or plastic is any colorless transparent sheet, lite or pane that can be seen through but is not optically clear. Some common glass and plastic names are pattern 60, pattern 62, Aquatex, Spraylite, bottle bottom, colorless chinchilla, DP30, DP32, ribbed and fluted among others names. This type of glazing (in glass or plastic material) is used where you want to be able to see a silhouette on the other side but not in perfect detail. Some examples where this might be used are shower doors, bathroom windows and room divider panels. It is also used in restroom doors and restaurant kitchen swinging doors to prevent collisions resulting from egress at the same time someone on the opposite side is reaching for, or approaching the door. Cellular, hollow, honeycomb or twin skin type materials (sometimes referred to as PCSS – polycarbonate structured sheet) that are used for “clear” hurricane shutters suffer the same misnomer. They are marketed under such names as Twin-wall, Thermoclear, Verolite, Polygal, Royalplast, Plastilux, Sunnex, Polynex, Greenhouse to name a few. One simple rule is, if you can’t read a newspaper through it from 6″ away, it is NOT CLEAR. You can call it colorless but to call it CLEAR would be incorrect. Clear would indicate optically clear or crystal clear with the characteristics of having no discernible distortion to the naked eye. 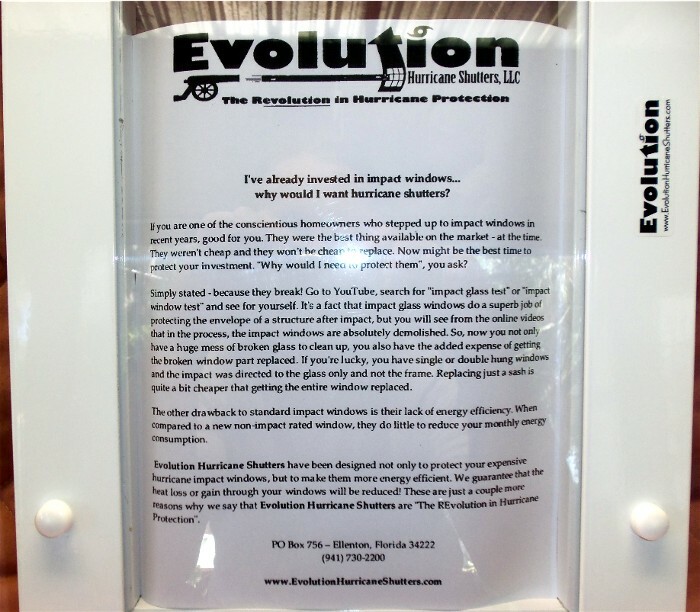 Just for the record, to the naked eye, Evolution Hurricane Shutters are crystal clear. clear glass. The water in the lake is so clear that you can see the bottom. Dictionary.reference.com: free from darkness, obscurity, or cloudiness; light: a clear day.